September 24, 2010 by Ken Ward Jr. In case you missed it, we have a story in today’s Gazette that reveals that the Manchin administration hasn’t exactly done everything the governor promised in the wake of Massey Energy’s Upper Big Branch Mine Disaster. Among other things, Gov. Joe Manchin has yet to come up with any concrete legislative proposals for adding to the mine rescue reforms he pushed after the Sago and Aracoma disasters and improving accident prevention in our state. A set of possible legislative changes, provided to the governor many weeks ago, hasn’t been submitted to lawmakers. But most specifically, today’s story focuses on the state’s failure to do any rock-dust testing as part of the inspection sweep the governor ordered just a week after the Upper Big Branch explosion — despite a specific mandate in his executive order that such dust sampling be done. Since Sago and Aracoma, Gov. 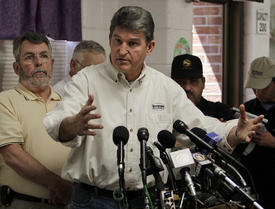 Manchin has made much of how West Virginia moved more quickly than the federal government to institute safety changes in the mining industry. And now, of course, the governor is running for U.S. Senate and continues to campaign in part on his opposition to the Obama administration’s coal policies. I’m going to do everything I can in this state. I can’t wait until the feds start moving. But it turns out West Virginia inspectors didn’t do the sampling that the governor ordered them to do — and even if they had, the state still hasn’t gotten a lab up and running to analyze those samples. I’m reminded of 2005, when Manchin and Carte Goodwin claimed extensive testing showed the air quality at Marsh Fork Elementary was okay. There was in fact no extensive testing, with Ken Ward reporting that the “expert” sent to do the test, Bill Elswick of the state board of education, admitted to not being an air quality expert. I don’t see Manchin caring more for the safety of miners than he does for the health of children, so I’ll be surprised if real tests ever come to pass. Vernon, maybe it would be more accurate to say that Governor Manchin is probably as a person concerned about the health of children and miners, but you don’t think he is doing what is necessary to best advance those ends. I don’t know much about the school air quality issue, other than that a new school is in the works. On miner safety, it appears that Manchin’s appointment of Davitt McAteer as an independent investigator was a good step toward getting at the truth relating to UBB and helping to protect miners. And Manchin must have signed on to subpoenaing the “Massey no-shows,” also a good step. Politicians – always a mixed bag at best! I think Manchin is playing it safe, walking carefully between pushing mine safety and supporting coal jobs. I like his passion to ensure WV thrives; however, his silence in allowing Don Blankenship and other coal execs to trash MSHA inspectors. I believe in a thriving coal industry, but I believe more strongly in making sure miners work safely. The Mine Act states specifically that miners should be involved with inspections and all safety matters where they work. Why is Manchin not supporting that? Robert C. Byrd sure did. Governor, please don’t blame MSHA along with Don Blankenship. Manchin was a coal broker and his son isreported to still run his busine Enersystems. Manchin got over 1/2 million fomr coal interests in the 2004 election, and money for either the party tent or renovations in mansion from them. He engineered a tax abatement (cooperate welfare) of 200 million or Consol Energy(Coal) and out of state Texas / Penn. Company that would have only created 60 jobs (wonder how many of these would have been executives brought in from out of state). Then he was going to do it 4 moe time. That’s a billion give away to Consol. Invested at 5% over 30 years itwouldequal over 4.38 illion, about equal to the true unfunded 30 yr. liability for PEIA (Public Employees Insurance) as determined by union audit. A recent study mention at OVEC web site shows mining costs state 97.5 million more a year, that state takes in. And that doesn’t count legacy costs – workman’s compensation or damage to environment. Link at OVEC leads to newspaper article about study and that links to study( see page 55 or 65).